The axial-dipolar part of the Earth's magnetic field, with field lines emanating from near the south geographic pole and converging near the north geographic pole. The Earth acts as giant magnet, somewhat like a huge bar magnet (although in fact it is more complex than that). It is most evident by the fact that a magnetic compass points towards Earth's magnetic north. Evidence has demonstrated that the Earth's magnetic field is decaying, which provides evidence for a young earth. This magnetic force is also responsible for holding a magnetosphere layer of charged particles called the Van Allen belts, which protect the Earth from cosmic bombardments. Our magnetic field cannot result from the natural magnetism of the Earth core, because the core is far hotter than the curie point of any metal. Therefore, it must result from electromagnetism, and there must be an electric current of great size flowing in a loop deep within the Earth. Current decreases with time due to electrical resistance; which is why the field is decaying. What then is the cause of this current? Those who hold the Earth to be billions of years old must believe that this current is generated by some ongoing process (i.e. the growth of the core, convection, etc). 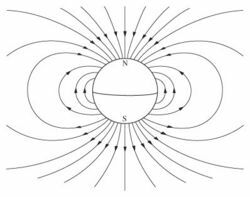 Most evolutionists hold to the magnetic-dynamo model of Earth's magnetic field. This idea is that motions in the Earth's core generate a self-sustaining magnetic field the reverses itself on quasi-regular intervals. The model has problems though. (See: Is the Earth’s magnetic field about to flip?) Biblical creationists generally accept that the current is a free flowing current formed at the time of creation subject to decay thereafter. The data from historical measurements agree with a decaying field generated mainly by the collapse of the Earth's magnetic field. Research by Russ Humphreys shows this is compatible with rapid temporary field reversals, such as may have occurred during the flood. The magnetosphere deflects the flow of most solar wind particles around the Earth. The Earth's magnetic field and the magnetosphere (Van Allen belts) protect us from most of the stream of charged plasma called the solar wind, which is constantly emitted by the sun. Cosmic rays from space and from the sun are made of highly energetic charged particles. These particles can be very dangerous to life. In high quantities they can damage tissue and cause cancer or even death. The Earth's magnetic field deflects and/or traps many of these charged particles. The Earth's magnetic field also shields us from most of the effects of the magnetic storms produced by coronal mass ejections. The interaction of these storms with the magnetosphere produces the Aurora Borealis and Aurora Australis. Some particles make it through the magnetic field, but the Earth's atmosphere also offers protection. A small percentage of particles get through both the magnetic field and the atmosphere and make it all the way to Earth's surface. However, there are not enough of these to be dangerous to life. The simple fact is that life as we know would not be possible without the Earth's magnetic field. Some types of bacteria would survive, but not much more. Recent physical observations from space-based telescopes have discovered that the Earth and Sun are connected together with flows of electrical current, exhibited as "magnetic connection" or "Flux Transfer Event" (FTE) . Further research indicates that the Sun's magnetic field powers the Earth's magnetic field, such that the two share an inextricable relationship. Does this explain magnetic field presence for all planets? Venus in particular exhibits a pair of elliptical-path, tornado-like vortices at each pole, which Barry Setterfield has designated are actually twisted-pair Birkeland Currents flowing through the planet. Magnetic fields are always the product of electrical current, as exhibited by the motion of charged particles through a medium. This page was last modified on 2 August 2014, at 18:06.